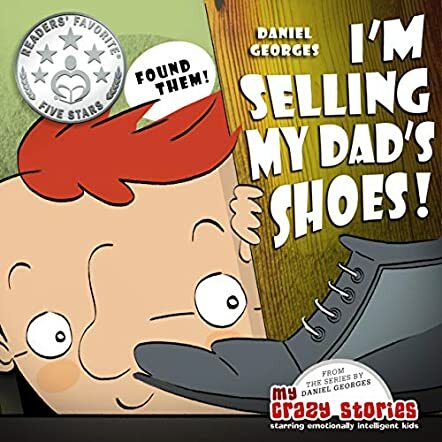 Kyle has no money to buy his dad a birthday gift and so he decides to sell his dad’s old shoes in the story I’m Selling My Dad’s Shoes (My Crazy Story Series) by Daniel Georges. He takes them from the shoe cupboard and sneaks out of the house. On his way to the market, a tall man stops him. He tells Kyle that his shoes are wet and he will give his umbrella in exchange for the shoes in Kyle’s hand. Kyle does not know what to do with the umbrella but he accepts it because he wants to help. Kyle decides to give the new umbrella as a gift to his dad. Further down the street, he meets an old woman who tells him she can give him Snappy, her dog, in exchange for the new umbrella. Kyle agrees but on his way back home the dog breaks free from the leash and runs away. Kyle is left with nothing; no shoes, no umbrella, and no dog. He is walking back home sadly when a man calls out to him for help. He gives the man the leash to strap the boxes onto his bicycle. He gives Kyle a ride back on his bicycle and gives him a gift. To find out what it is, you have to read the story. This charming story is about being kind, giving, helping, and being generous. The illustrations are funny and lively and they give a good pace and movement to the story. It is a lovely storybook for children as it teaches them good values through the story of Kyle. ‘You get what you give’ - the story shows how important it is be generous and it encourages giving. It is definitely an excellent book for parents and teachers to read out to youngsters.